The Mega Genius is a tool that has been developed to alleviate the work of the person who puts reinforcing bars in the machine. In order to do this in a good way, the bars have to be knocked out, which is damaging to the employee’s body. The Mega Genius lifts the rods into the machine with the help of a magnet. The system is therefore especially developed for the companies that want to save the staff and process large quantities of reinforcing steel, because it can move large tonnages of reinforcing steel in a short time. With the Mega Genius, multiple bars up to a diameter of ø 32 and a length of up to 18 meters can be lifted and placed in the machine. The magnet go down to lift the reinforcing bars. 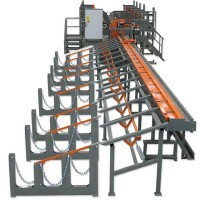 The bars are placed on a chain roller equipped with sensors to count the required amount of bars. They are then placed in the cutting plant. This lifting requires a few additional actions. Because the bar is lifted in only one place, it is important that the bars are pulled out of the bundle. This is done with the aid of two grippers, which support the bars on both sides of the magnet and stretch the bars by sliding outwards. 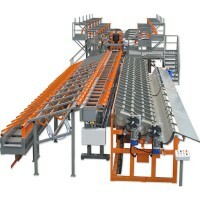 After this the Mega Genius drives to the feeding conveyer of the cutting plant to process the counted bars. 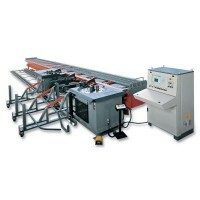 The Mega Genius can in principle be connected to any conventional computer-controlled cutting system. This creates the possibility to apply the system as widely as possible. Mega Genius is reducing labor and much higher production. A strong and fast double bender which can also easily make pocket bars without making adjustments on the machine. By using a clear and easy to operate control system, working with the ROBOMASTER 45 is very simple. Capacity up to 40mm. 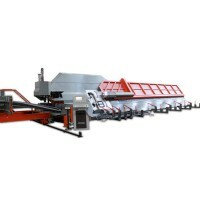 A robust and fast double bender which can also easily make Z-shaped bars without making adjustments to the machine. By using the latest technology with SERVO drive and a clear and easy to operate control system, working with the ROBOMASTER 60 is very simple. Capacity up to 3x 32mm and 1x 50mm. 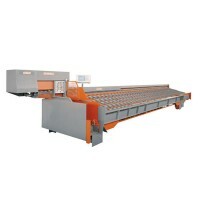 The installation series is characterized by the possibility to assemble the machine as required. The machine can cut, bend or double bend. The storage carriage can be loaded with multiple diameters (bundles of 2500kg). 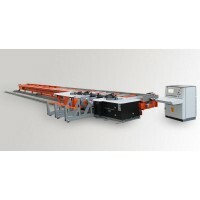 The optional insertion machine type GENIUS ensures automatic loading of the bars. This unique device also counts the number of bars that have to be processed. By the use of 2 bending heads, U-shaped bars can be bend. The bar then comes on an optional collecting carriage. 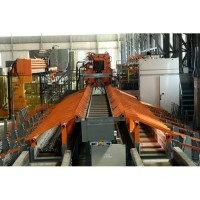 This installation is also characterized by the fact that the machine can work per element. 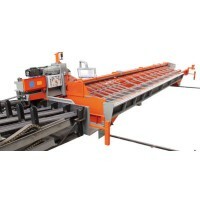 Schnell has a very wide range of machines for cutting bars, whit a perfect condition for operator. 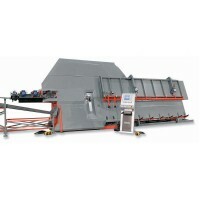 The machines can drive in front of the storage compartments to process the respective diameter. The bars are brought into the machine by minimal effort. This can be made even easier by using the automatic input device GENIUS. After this, the production is automatically processed. The bar lengths are computer-controlled cut and collected in the chosen pockets trays. The machines are perfect for small and versatile productions. The BAT series consists of more than 10 models. So there is always a machine for your needs. 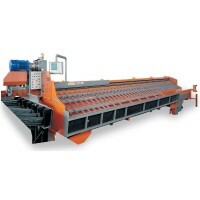 SCHNELL is the supplier for stationary cutting machines of the reinforcing steel. In the stationary storage compartments, several diameters with a bundle weight of 5000 kg per compartment can be used. The bars are introduced into the machine by minimal effort. the Mega Genius. After this, the production is automatically processed. 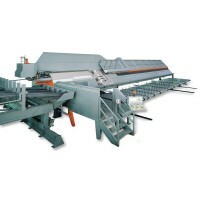 The bar lengths are automatic cut on the right length, computer-controlled process, trim and collected in the desired collection trays. The machines are very suitable for small and large production series. 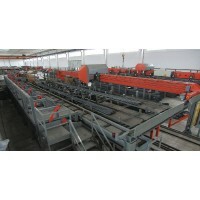 The METROLINE is a new type of bending and cutting system for reinforcement steel bars processing. This installation takes the hardest work from the operator out of the hands, namely pulling bars to the right length. With this installation, the operator can increase his productivity to a new and higher level. The METROLINE is probably one of the most profitable investments a company can make in the reinforcement industry today. The small and medium-sized reinforcement plants and / or concrete factories can process productions up to and including 32 mm with this installation. The METROLINE is very easy to use and maintain, giving the maximum capacity with flexibility. 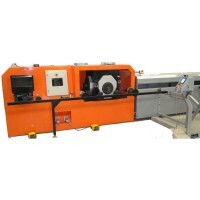 The METROLINE can cut and bend bars with an automatic measuring system. His function is: cutting, measure and bending. The METROLINE consists of a stock stand, the vertical combi machine CDR32-ROTAR and the METROTAB measuring unit.